(MissionNewswire) Connecting with street children is challenging anywhere but is even more so in Sierra Leone, which ranked last of 179 countries in the 2008 Human Development Index for the well-being of its people. 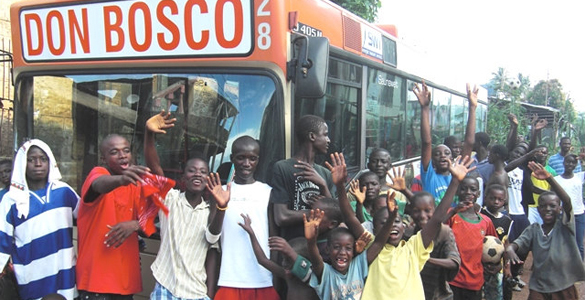 To respond to its street children in crisis, Don Bosco Fambul of Sierra Leone has developed two unique programs which reach children wherever they are – an outreach bus and a 24-hour crisis line. The brightly colored bus, known by some as “Hope on Wheels,” provides much needed protection to street children like Edward, a 14-year-old youth who recently told how he and other Sierra Leone street children have been threatened, beaten and jailed by police for no apparent reason. A recently released investigative report titled, “Children of the Street,” published by Fambul, reveals how street children are unfairly targeted for abuse by law enforcement agencies responsible for looking after these vulnerable members of society. The outreach bus operates as a full-service support center where children can receive basic health care and counseling services as well as play games with friends and watch educational movies. Each day, staff members work for and with 1,500 disadvantaged street children and youth. “Don Bosco Fambul reaches out to an estimated 2,500 street children living in the region – 500 of whom are girls. The Don Bosco bus will help those who have been abandoned by their parents, the government and unfortunately even those who are supposed to protect them. They are facing emotional trauma from the war, family separation and poverty,” says Fr. Mark Hyde, director of Salesian Missions (the U.S.-based fund-raising arm for Salesian programs around the globe, including this one). Another program – the 24-hour crisis line for emergency and advisory services – extends Don Bosco Fambul’s ability to reach youth in need far outside the borders of Sierra Leone’s capital, Freetown. “The phone line allows youth closeness and distance at the same time. They hear a voice talking to them and feel safe – and are therefore able to speak about their problems confidentially. This is especially important in cases of sexual abuse of girls and young women,” says Fr. Hyde.